VANCOUVER — Ballard Power Systems says Kenworth Truck Co. will use its FCveloCity-HD 85-kilowatt fuel cell engine to power a hybrid class 8 truck as part of a two-year demonstration project. It would be used to haul shipping containers from the ports of Los Angeles and Long Beach to local warehouses and intermodal facilities. 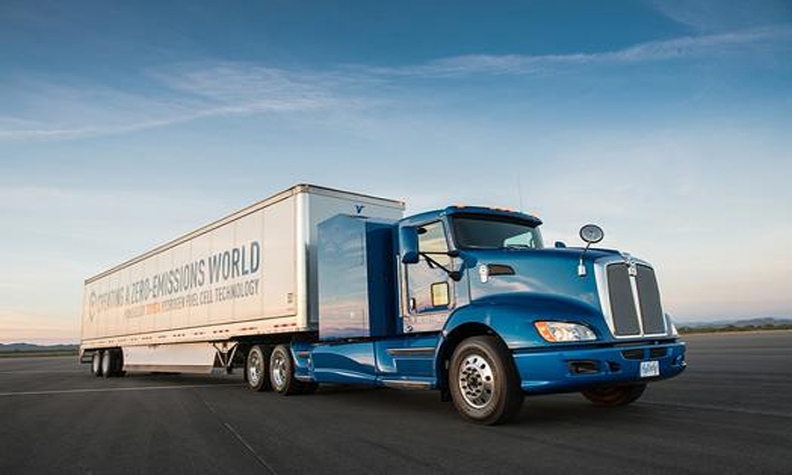 The fuel cell engine would recharge onboard lithium-ion batteries that power the truck’s electric motor, extending its range to allow for a full day of regional hauling applications. Ballard already supplies fuel-cell engines as range extenders for transit buses. Chief Commercial Officer Rob Campbell said the Burnaby, B.C., firm sees growing demand for zero-emission systems that give trucks traditional range and refueling times similar to diesel engines. Kenworth chief engineer Patrick Dean said hybrid-electric powertrains likely will be required to meet emissions regulations in several U.S. metropolitan areas. California is considering requiring zero-emission standards for port short-haul trucks operating in certain areas, he said.